SKI & SNOWBOARD BOOT HORN - HELPS PUT SKI BOOTS ON EASIER! Full directional twin shaping in a wider platform is just what your osteopath ordered, right?. Anti-Chip Micro-Cap –Micro-cap construction is a hybrid of two construction techniques: a premium, sandwich sidewall construction fused with a lightweight, durable cap construction. Included here are a pair of 177 Volkl mantra skis and din 16 Salomon Guardian AT bindings complete with fitted Volkl "no stick" Vacuum climbing skins. Volkl has developed a revolutionary setup for you to get to the top of your favorite backcountry lines. 2017 Volkl Kendo. Look adjustable demo bindings. Top sheets are in pretty good condition with a few blemishes. Bases have a couple scratches, but no core shots. Edges are perfect. See photos for more info. 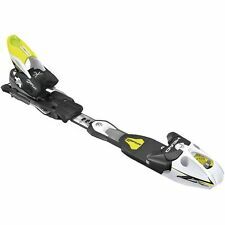 Line 90cm Five-O Skiboards Skiblades W/ FF Pro Bindings Blue. Condition is Used. Shipped with USPS Priority Mail. Great shape, little sticker leftovers on the tops which will clean right off. Each snow season, beginners at downhill skiing will need to pick up several pieces of equipment while the experienced athlete will need to replace or upgrade gear. Whether it's boots, skis, or poles, you can find them in a variety of sizes and designs. Take a look around and find the set of winter sports equipment that works for your skill level. 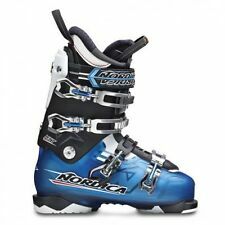 How do you determine the proper size for ski boots? Measure your foot: Using a tape measure, measure the centimeters from your big toe to your heel. Try on the boot: Insert your toes all the way to the front. Kick your heel into the boot, buckle up, and then stand up. Check to make sure you can wiggle your toes. Test the shell fit: Wearing a winter ski sock, take the liner out and insert your foot into the shell. With your toes all the way to the front, measure from heel to shell. You'll want between 1 and 1.5 centimeters of space. How do you determine the proper ski size? When it's time to hit the mountain, you'll want the size of your skiing equipment to fit your experience level. New skiers: Shorter sizes will help the new skier turn easily, allowing them to maneuver safely on the beginner's slop of the mountain. Intermediate: Short or long, you'll want equipment labeled for any type of snow. When the ski is vertical, it should land between your nose and eyes. Longer skis will mean wider turns. Advanced: You'll want to pick your item based on the types of turns you'll be performing on the mountain. Shorter items will give you quick and narrow turns on complicated trails. Do you need to change your bindings? Most accessories for skiing have bindings, which are acceptable for your average beginning and intermediate-level skier. The manufactured bindings will provide simple turning and some additional flexibility. If you're looking into the more advanced territory or want a different release setting, you can look into non-integrated bindings. These downhill sports accessories may provide improved performance functions for those in competitions or needing a special feature. Are poles designed to be one-size-fits-all? 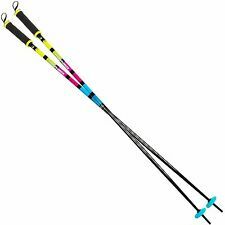 While many skiers on the bunny slopes will not need ski poles, those using trails will want to find a pole which keeps their arms at a safe angle. When you're wearing your boots, hold the pole vertically with the grip on the bottom. Place your hand under the basket. The ideal fit will have your elbow at a 90-degree angle. This reduces arm and elbow fatigue during your session.